Today as I was reading in Corinthians about pulling down strongholds I remembered this stronghold I saw in Sepphoris/Tzippori in Israel. It would be very hard to pull down. It has been there for a very long time. You can see from the depth of the window openings how thick the walls are. 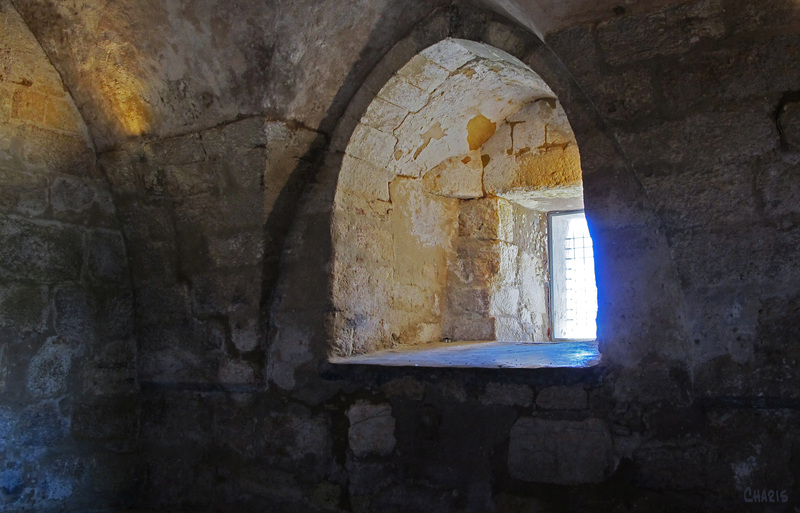 Our guide told us it was built by the Crusaders on the top of the hill the Roman city sat on (about an hour’s walk from Nazareth) and later rebuilt by the Ottoman Turks. What fascinated me was that the builders scrounged stones and sarcophagi (stone coffins) from previous dynasties to use in the construction. A cornerstone is the most important stone in a building because the other walls line up with the angles it establishes. In the photo the long rectangular stones are sarcophagi. These walls aligned with receptacles for the dead. Soldiers holed up inside fortifications like this would rain down arrows, and later bullets, on anyone daring to approach. In 2 Corinthians Paul talked about the believers’ need to rely on different weapons than the ones used by human armies to tear down these seemingly impossibly strong fortifications. The Greek word translated “arguments” here is logismos, which means just what you think it would: reckoning, reasoning, computation, conclusion –all the things those of us educated in the West hold as the gold standard for decision-making. We gather data observable by our physical senses, make logical deductions, theorize, debate and come to a conclusion. Some of us hold this process in such high regard we require faith and the ways of God to pass through the same intellectual sieve. We have so elevated logic and our own intellect and reasoning ability that anything God does outside of the every day observable repeatable data-gathering experience is often rejected as myth or explained away as a re-telling of a misunderstood event by the superstitious. Any theory is only as good as the presupposition it is built upon. Sometimes some of the old false ideas we have as foundational beliefs are so protected by thick-walled strongholds that no amount of argument, or ridicule or cannon balls or plastic explosives can tear down our defences. 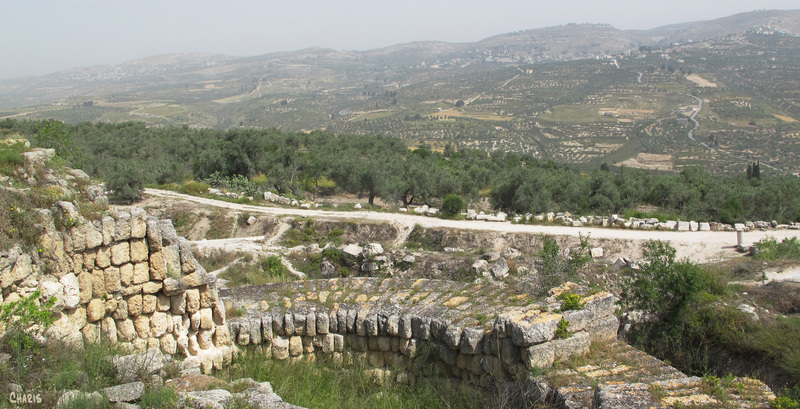 Shortly after we visited Sepphoris we explored the ruins of the ancient city of Samaria. 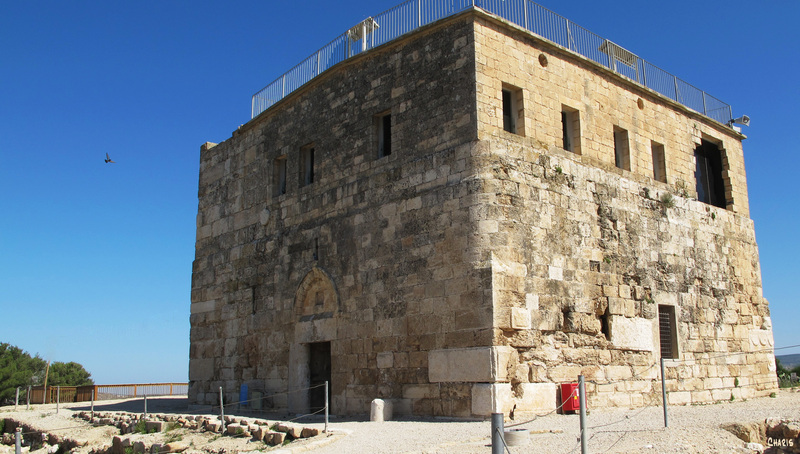 The fortifications in the photo were built by Herod upon the foundation of the city where control-freak Jezebel’s left-over bits were buried after zealous Jehu convinced disgruntled eunuchs to toss her out the window and the dogs had her for breakfast. The story is told in 2 Kings 7 that when this city was under siege and the people were desperate with fear and hunger, to the point of killing and devouring their own babies, the prophet Elisha told the king’s right hand man that the next day food would be cheap. Elisha told him he would see it, but not get to eat it because of his unbelief. The next day he was trampled in the gate when the inhabitants rushed out to grab the provisions the confused enemy had left behind when they heard frightening noises in the night. God arranged the impossible. I wonder if we miss out on a lot of provision because we exalt our past disappointments and reasoning ability above the promises of God. Unlike the lepers in the story, we never bother looking beyond the gates. I wonder if the spiritual armour offered for our use in this war of the mind — the helmet of salvation, the breastplate of righteousness, the belt of truth, the shoes that come from the preparation of the gospel of peace, the sword of the spirit of the word of God, and the shield of faith– free us up to recognize God’s way of thinking. What if our most effective weapons are the fruit of the spirit: love, joy, peace, patience, kindness, goodness, faith gentleness and self-control? I wonder how much more of God’s perspective we would be able to perceive if we pulled down those thick walls that make “It couldn’t happen,” look like the only reasonable premise. True. But He didn’t stop there, as we often do. “But I have overcome the world,” He said. Edited to add: In the process of checking the spelling of the plural of sarcophagus (everything looks good until I hit publish) I had a surprise. The word sarcophagus comes from sarx meaning flesh and phagein meaning to eat. The word means literally flesh-eating. It was a pay-attention moment. Some of you may have followed the story of how our son-in-law was on the brink of death from flesh-eating disease and how many people, some of whom had never done this before, took up the call to pray for his healing. On Pentecost Sunday, amid cheers and spontaneous outright bawling, our son-in-love walked into church on his own two legs, with his feet and all his toes attached and with kidneys and lungs functioning like a healthy twenty-year old. The past disappointments and thick walls in our lives become idols because we place them before the Lord, in our thought life. Love how they used old coffins in the fortress. What a picture of the death in this type of thinking. Love how God can do visuals! Thank you. It’s good to be home. Incredible! God is good, God is great, God is wonderful! Thank you for taking the time to comment. You have now encouraged and inspired me. oh to cry and laugh at the same time! Thank you Jesus for LIFE – for HEALING – for MUSIC – for Your sacrifice of LOVE! What timing to have this trip and these messages. God is most amazing!